North Carolina protests against HB2 | Fight Back! 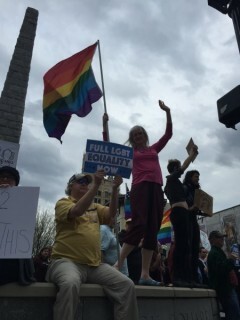 Asheville NC - Dozens of people came out to protest Governor Pat McCory’s bigotry law HB2, May 14. They gathered at Memorial Stadium and marched to a Town Mountain Mansion where McCory meets for an annual open house in Asheville. “HB2 is one of the most asinine laws we have seen in this country since the Jim Crow,” remarked community activist Tiffany Wilkins. Not only does it criminalize trans people who use the restroom of their gender, it also broadly forbids any discrimination claims to be made at the state level and puts a cap on minimum wage at the state’s unlivable $7.25 per hour. Meanwhile a dozen more protesters went inside to confront McCory and the local county commissioners about the hate law, many wearing shirts saying “This is what trans look like.” Gabe, a local transgendered high schooler at Asheville High came personally to tell McCory how sacred he is and hard it is for him being forced legally to use the woman’s restroom. Governor Pat McCory and his republican henchmen shoved HB2 down the throats of the people of North Carolina. Hundreds of protesters have been arrested. Most recently over 50 were arrested staging sit-ins at Raleigh’s capitol building and for refusing to leave House Speaker Tim Moore’s office. This bill criminalizes and further marginalizes the trans community, it take away what fragile protection they had previously under the law. The Federal Department of Justice has declared that HB2 violates the Civil Rights Act and has given the North Carolina state government an ultimatum: change course or lose federal funding to the state’s public institutions. We need to keep organizing and fight for equality. It was not about water fountains then and it is not about bathrooms now.